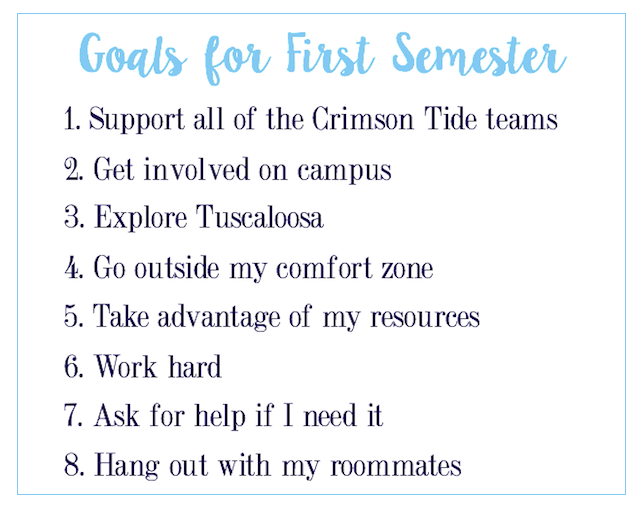 Since I am starting actual school in a little more than a week, I thought I would share with y'all what my goals for my first semester ever of college are. I am super excited for my first semester of college. It's such a new adventure, and I haven't really had to do something new in a while. I got in such a routine while in high school, and I am excited to have something to conquer. Alabama is known for its football obviously, but there are so many other great sports at this school. Plus, all the events are free. (Football tickets are $5 and involve a blood bath to get.) Why would I not go? I have got to keep my most spirited streak alive. In the fall, women's soccer and volleyball and swimming & diving are going on in addition to football, and as it gets closer to winter, men's and women's basketball will start. I love being involved in things. I feel like without it I would be so bored. Whether it is being involved in one of the sororities or in one of the hundreds of clubs that Alabama has, I want to be a part of it. 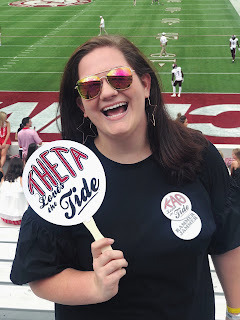 While I am sure I could be perfectly content with staying on campus, I want to go out and see what's in the city of Tuscaloosa. It's such a cute city, and I want to get to know the place I will call home for the next four years. Meet the person who is 100% okay with her comfort zone, but that's not what college is about. I want to go out and meet people and do things that I wouldn't have had the courage to do a year ago. I don't want to regret any moment that I have while in college. Alabama offers so much to students, and I want to be able to use their resources to the best of my ability. I want to get to know my professors and utilize the career center. When will have a chance like this again? I am in college to get a degree first and foremost. I want to spend first semester working hard and figuring out what works for me and what doesn't. I want to work toward my goals and do things that will help me get there. Much like staying in my comfort zone, I am 100% okay with not asking for help, but I know that's not healthy. I don't have my mom to lean on anymore. If my anxiety gets bad, I need to talk to someone about it. If I am struggling, I need to talk to someone about it. I need to advocate for myself. Finally, I want to build good relationships with my three roommates. I am so excited to be living with who I am living with, and I am pretty sure we will get along great.